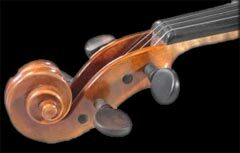 Would you like to hear a very special violin that has waited patiently over 240 years to render exquisite music just for you and your guests at your next function? Joannes Guadagnini, 1711 to 1786, a craftsman and Contemporary of Antonio Stradivarius crafted excellent violins. At his peak he created a magnificent instrument that today is the pride and joy of Norman. Norman would be delighted to demonstrate his talent in presenting classical and romantic music for your special occasion. With the purity of tone that only an instrument of this excellence can ever produce!